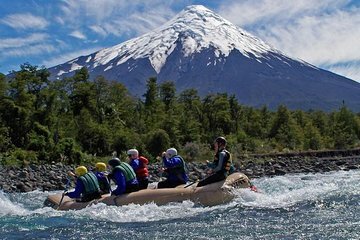 Tackle the class III and IV rapids of the Petrohué River on this adrenaline-fuelled 6-hour white-water rafting excursion, including round-trip transport from Puerto Varas. Enjoy around 2 hours rafting as you paddle through the heart of the Vicente Perez Rosales National Park, from Todos Los Santos Lake to Reloncaví fjord. Stop to swim and admire the scenery as you zip downstream, then celebrate with a classic Pisco Sour cocktail.